What types of film do you scan and transfer? 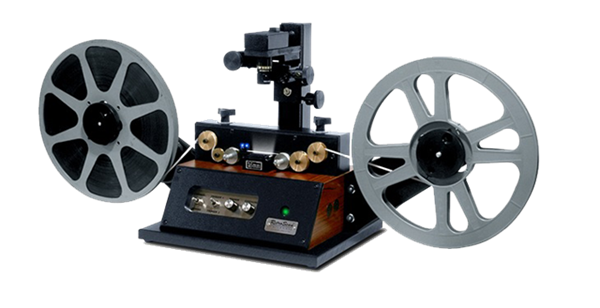 We utilize our in-house film transfer services on 8mm, Super 8mm, and 16mm film, including Super 8mm film with sound, and 16mm film with either magnetic or optical sound strips. We can provide outsourced film transfer for 9.5mm and 35mm film formats. What is your Film Scanning Process? All film conversion processes include film inspection, cleaning, and repair. We repair old splices, remove blank film and damaged perforations, and replace the leader if necessary. Prior to scanning your film, we carefully clean it with a special solvent and no lint cloth. We use high definition film scanners (MovieStuff units - HD Snipers and Universal Retro's) to digitally scan and record the entire contents of each frame of your 8mm, Super 8mm and 16mm film. The captured film content is transcoded into an intermediate AVI or MOV file type, and then edited and reformatted into your specific requested product output. Example of output are DVD, Blu-ray Disc, mp4 movie files for viewing on computer, MOV or AVI movie files for editing, and Image Sequence Files (also for editing). Film from multiple small reels (3” reels) is consolidated onto larger 7 inch reels for transferring purposes and for better storage. All original film is returned on either the film’s original reels or on 7 inch 400ft take-up reels. We offer ventilated archival can containers as an option for long term storage. The film reels or canisters retain their original markings (customer notes and sequence numbers). We offer related service products for color correction, audio capture, background music for silent films, custom menus and onscreen chapter titles. What conversion options do you offer for the customer’s film? Customers can order DVD, Blu-ray Disc, Standard or High Definition file types such as MP4, MOV, Apple ProRes, AVI, etc. We use Adobe's editing suite found in their Creative Cloud Premiere Pro. Almost any file type can be formatted using this tool. If you are wanting file types to share with others across the web or watch on your SmartPhone, we recommend H.264 MP4 files in progressive format. If wanting to edit the files, we recommend a less compressed file type such as DV25 NTSC MOV. We can also provide Apple ProRes file types to serve as long term storage master file copies. Data files can be returned to the customer on data disc, flash-drive, external hard-drive or via web download. Why choose High Definition final formats over Standard Definition film formats? 1. Better picture quality - almost 3x the information is captured and presented in HD's 1920x1080p format as compared to SD's 720x480 format, resulting in better color and clarity when shown on HDTV via Blu-ray Disc, or via media player reading a h.264 high definition mp4 movie file. 2. More Content - the HD film scanner captures all film content outside the standard 4x3 aspect ratio associated with SD film transfer. The HD product can show the entire films frame's contents; presenting a more complete transfer of what was originally recorded. If the final output is a Blu-ray Disc, we can apply a mask (crop) that presents a larger viewing area than SD's 4x3 but does not show the film frame's less developed edges or film perforations. If requested by the customer, the final output can be a high definition data file for later editing, retaining all content from the film frame, showing everything as originally recorded (including the film's perforations). 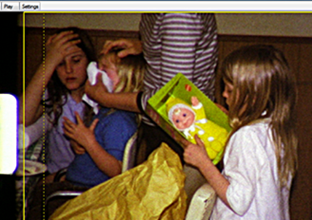 The screenshots below shows the extra content captured by the HD film scanner. Everything outside the yellow standard definition (4x3 aspect) box can be included in our HD data file formats. The next picture below is of a Super 8mm film frame. 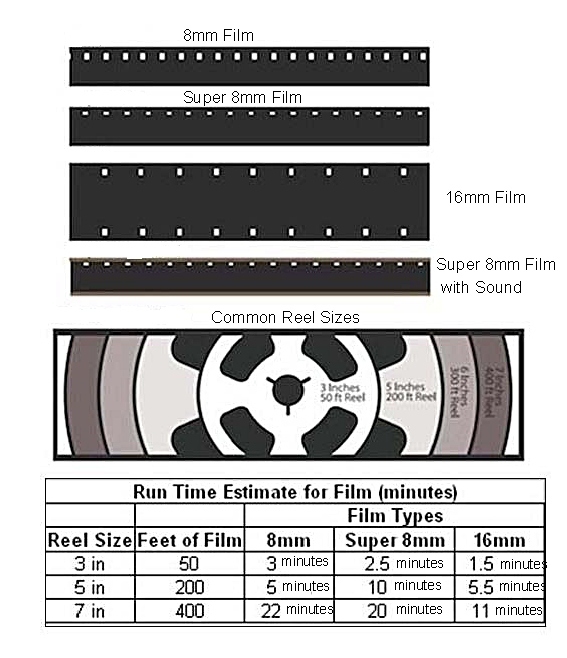 Super 8mm film is wider than 8mm film. The dotted yellow line represents the pre-set standard definition 4x3 mask, and the solid yellow line is the pre-set high definition mask, displaying more content on Blu-ray discs or HD data files. Again, for the customers wanting data files, we can provide complete side to side content in the final product. Film with Sound - Some 16mm and Super 8mm film have magnetic or optical sound strips, and we can transfer this sound along with the movie capture. If the movie film is silent, we offer unlicensed background music from a library of easy listening, instrumental, country western and soft rock selections. If your customer prefers licensed music for their background music, we supply that as well. They need to tell us what they want from which artists. The customer may also want to add voice-over narratives to the film transfer; the third person narratives are a great way to hear the stories that went with some of those memories. How much film can fit on a DVD or Blu-ray disc? DVDs can hold up to 2 hours of playable content or 4.7GB of data. This is equivalent to 1,600 to 1,800 feet of film 8mm or Super 8mm film or 3,200 feet of 16mm film. Blu-ray disc can hold up to 8 hours of standard definition video, 3.5 hours of high definition video, or 25 GB of data. What size hard-drive do customers need for film transfer? 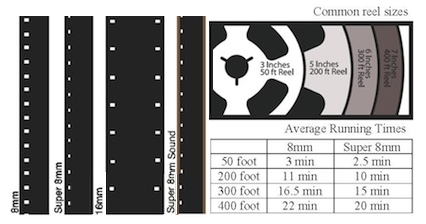 Click here to view a table with film and video file types and their corresponding storage size requirements. Will customers be able to edit a file version of their film? We offer transfer of uncompressed files to hard-drive or data DVD for editing purposes. If you would like to do your own editing work simply choose either option when placing your order. If you do not have editing experience, but would like your valuable content edited click here to find out more about our premium editing services. Do we return the customers’ original film? Yes. After your order has been completed the new media is packaged together with your original film and it is returned to you in the same condition as we received it. Is the film transfer content copyrighted, like it is with some film transfer shops? Is it OK to make copies within our Store and not at Cintrex? The transferred film content in not copyrighted by Cintrex. Copies can be made by the retailer at their store, or we can make copies of the DVDs for $6 each (whsle) or $10 retail. Why do we splice 50 foot reels together? Splicing 50 foot reels together allows for long uninterrupted segments of film that make your viewing experience more enjoyable. It also allows us to have a more consistently high quality product. How can I tell the difference between 8mm, Super 8mm, 16mm film and 35mm film? What are some of the common problems in Film Transfer? Jumpy or Vibrating Pictures - caused by either damaged film perforations, or by incorrect film loading in the original movie camera. Black film- If there are sections in the customer’s film that are black, showing little or no image, that is due to film that was either badly exposed or not exposed at all. At Cintrex AV, we will remove these sections before making the film transfer. Thin, Light Pictures- Light or overly bright picture is caused by film that was Overexposed when it was developed. Wavy Pictures- happens because the film is warped or shrunken. Blurred or Fuzzy Pictures- This is caused by incorrect setting of the camera focus or extreme close-ups taken with a fixed-focus camera. Blurred or Doubled Images- Pictures that show double images or blurred scenes with a vertical “jumpy” effect are caused by problems with threading the film into camera or a camera that is out of adjustment. Heavy, Foggy Shadows- This is caused by failure to make allowances in exposure for side or back lighting. For example, a scene that is shot with the sun facing the camera. In this case, special allowances must be made when exposing the film due to the amount of light that is captured. Better results will be seen when the camera operator shoots with the sun or bright lighting behind the camera, sometimes called front lighting. Pictures Misty or Flat All Over- This is caused when the camera lens is veiled with dust, moisture, or oil. Light Circular Spots or Curved Streaks- This is caused by the sun or a light source shining on the camera lens when the film was captured. Lines and Scratches- Continuous or intermittent perpendicular lines or short perpendicular scratches in the picture are caused by dirt and other particles that accumulated in the camera that captured the film. It can also be caused by film that was not properly threaded into the camera. Yellow Pictures- This is caused by a yellow filter (for black and white pictures) accidentally left on camera or waiting too long between exposure and processing. This can also be caused by excessive heat. Excessive Redness- This can be caused by pictures taken in the early morning or late afternoon sunlight or Kodachrome film that is not exposed properly. Excessive Blueness- Kodachrome Film used in the daylight without the proper filter. Customers can order as many copies as needed. When placing your order you will be asked how many copies you would like. Can we transfer broken or damaged film? Yes. We will splice together broken film and removed damaged sections so that the remaining film can be captured.